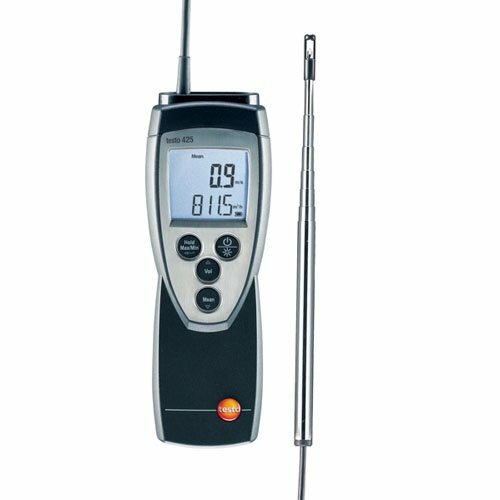 The compact Testo 425 Thermal Anemometer is an easy to use anemometer with attached thermal probe on a telescopic handle. Just enter the duct measurements directly into the Testo 425 and volume flow measurements (cfm) are shown on the clear display. You can switch between flow and temperature readings easily. Timed and multi-point mean flow calculations allow easy flow analysis, volume accumulation estimates, and temperature variation monitoring. Min-Max values are at the press of a single button, while the "Hold" function freezes the current readings in the display for easy data recording. The 425 comes with the temperature measurement and telescopic handle, 9V battery, and calibration protocol.